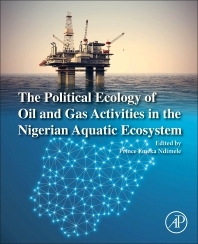 The Political Ecology of Oil and Gas Activities in the Nigerian Aquatic Ecosystem reviews the current status of the ecosystems and economic implications of oil and gas development in Nigeria, a key oil-producing state. The ecological and economic impacts of oil and gas development, particularly in developing nations, are crucial topics for ecologists, natural resource professionals and pollution researchers to understand. This book takes an integrative approach to these problems through the lens of one of the key oil-producing nations, linking natural and human systems through the valuation of ecosystem services. 9. The Global oil Industry and the Nigerian Environment. 10. The Nigerian Economy before the Discovery of crude oil. 28. Reactions to petroleum exploration from oil-bearing communities: What have we learnt? Dr. P.E. Ndimele has a PhD in Fisheries Management, with a focus on Hydrobiology, Environmental Toxicology and Ecological Restoration. He is a fellow of the Europe-African Marine Earth observation Network (EAMNet), a member of several learned societies like Fisheries Society of Nigeria, Association for the Sciences of Limnology and Oceanography, Society of Wetland Scientists and Society for Ecological Restoration. His research interests are Environmental Toxicology and Ecological Restoration.